Although long-range, precision navigation systems like GPS or GLONASS were designed to be independent as much as possible of the performance of either transmitting or receiving antennas, the antennas used still have some influence on the system performance. The transmitting antennas installed on the spacecrafts have a shaped beam to supply any Earth-located user with the same signal strength and use the on-board transmitter power more efficiently. Maintaining the same signal strength is especially important in CDMA, since the GPS C/A-codes are too short to offer a very good crosstalk performance. The ideal receiving antenna should have a hemispherical radiation pattern, offering the same signal strength from a satellite at zenith and from another satellite just above horizon. Further, the receiving antenna should match the transmitter polarization (RHCP) in all valid directions. Finally, the receiving antenna should attenuate any signals coming from undesired directions, like signals coming from negative elevations, since these are certainly reflected waves and the latter are a major source of measurement errors due to their unknown propagation path. Although a turnstile antenna (two crossed dipoles fed in quadrature) with or without a reflector is frequently used for satellite reception, this antenna is not very suitable for satellite navigation for several reasons. The polarization of a turnstile antenna is circular only in the zenith direction and is completely linear in the horizon plane. Therefore, a turnstile antenna offers no discrimination between the desired RHCP direct wave and the unwanted LHCP reflected wave, since circularly polarized waves change their sense of polarization on each reflection. Reflected waves cause severe measurement errors and a relatively slow and deep signal fading, so that the receiver even looses lock on the signal. A better alternative is a microstrip patch antenna. A single microstrip patch resonator provides a useful radiation pattern with a reasonably circular polarisation over a wide range of elevations. Unfortunately the radiation pattern of a microstrip antenna falls down to zero in the horizon plane. Microstrip antennas are usually used when a simple, low-profile antenna is required, usually to be installed on a vehicle roof. Since low-elevation satellites can not be received, a microstrip antenna usually limits the available GDOP. 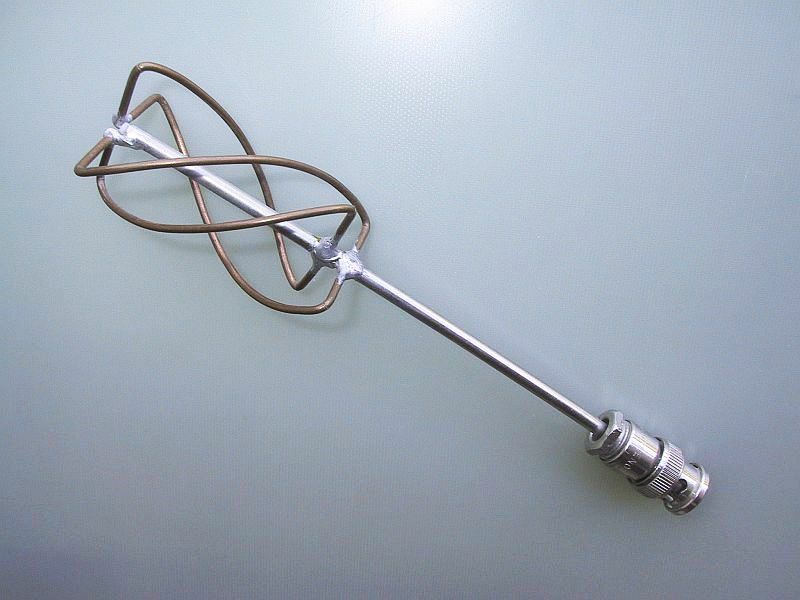 The best antenna for satellite navigation and other applications requiring hemispherical coverage seems to be the quadrifilar backfire helix (also called a "volute" antenna). Such an antenna provides a shaped conical beam. The beam shaping and cone aperture can be controlled by adjusting the helix radius, turns pitch distance and number of turns as described in . By the way, the same type of antenna is frequently used on low-Earth orbit satellites, like the NOAA weather satellites. As the GPS and GLONASS satellites already provide a constant signal strength for Earth-located users regardless of the satellite elevation, no particular beam shaping is required for the receiving antenna. The optimum number of turns of a quadrifilar backfire helix used as a GPS or GLONASS receiving antenna seems to be between 1.5 and 3. Making a quadrifilar backfire helix longer by increasing the number of turns does not have much effect on the gain or the beam-cone aperture, but it improves the beam shaping and further attenuates the undesired lobe in the opposite direction (downwards). Although the best GPS receivers use such a quadrifilar helix with 1.5 or 2 turns, such an antenna is difficult to manufacture and test. In particular, the four helical wires have to be fed in quadrature and there is very little space on top of such an antenna to install the feeding network. Further, a 2-turn backfire helix is rather large (20cm high) for a portable receiver. If its improved pattern performance is to be fully exploited, the direction of its axis should not deviate too much from vertical and this is not a very practical requirement for a portable receiver. Most GPS/GLONASS receivers therefore use a simpler antenna, usually a short one-half turn backfire helix like shown on Fig. 16. Making the quadrifilar helix shorter resonance effects can be used to feed the four helical wires with the proper signal phases. In particular, one pair of wires is made shorter to make its impedance capacitive at the operating frequency and the other pair of wires is made longer to make its impedance inductive at the operating frequency. To obtain RHCP a conventional end-fire helix has to be wound like a right-hand screw. The backfire helix is just opposite: to obtain RHCP the backfire helix has to be wound as a left-hand screw, besides the proper phasing of the four helical wires, of course! Further, the backfire helix requires no reflector. The four helical wires are fed at one end of the helix and shorted together at the other end of the helix. Since the main (desired) radiation lobe is directed towards the feedpiont and away from the shorted end, such an antenna is called a backfire antenna. The feedpoint impedance is in the 50ohm range, symmetrical. A good match to 50ohms is usually sacrified for the radiation pattern which is much more important. Usually one of the four helical wires is replaced by a semi-rigid coaxial cable of the same outer diameter to form an "infinite balun". On the other hand, the performance of the antenna is not degraded much if no balun is used like shown on Fig. 16. In the practical construction of a half-turn quadrifilar helix it is especially important to respect the exact lengths of the helical wires, since the antenna uses resonance effects and is rather narrowband. The dimensions shown on Fig. 16 are for the GPS L1 frequency (1575.42MHz). A GLONASS L1 antenna should be approximately 3% smaller. Finally, an antenna for both GPS and GLONASS L1 channels can be built by designing it for the average of the two frequency bands. In all satellite microwave receivers it is usual to install a low-noise amplifier close to the antenna to avoid any feedline losses and make use of the very low sky noise temperature in the microwave frequency bands. A GPS or GLONASS navigation receiver does not require a particularly low-noise antenna amplifier since the omnidirectional antenna collects lots of ground noise (300K) and the systems themselves were designed with large margins allowing a receiver noise figure of 5dB or even more. Using a better antenna amplifier can only bring marginal improvements. A two-stage GaAs FET antenna amplifier  was initially developed for a GPS receiver. This amplifier is using lumped components (coils) for input, interstage and output matching (see the circuit diagram on Fig. 17) and is constructed in free air to minimize any matching circuit losses (see the layout on Fig. 18). Further, this amplifier circuit design provides stable operation even with highly resonant sources like the described quadrifilar helix antenna and in practice the circuit resulted easily reproducible. The antenna amplifier is built inside a small metal case with the dimensions of 50mm(length)X20mm(width)X X15mm(height) with BNC connectors for both input and output. Since the supply voltage of +12V is fed through the output connector, care must be exercised not to swap the two connectors in practical use! On the other hand, the suggested preamplifier case is small enough to avoid resonance problems with ordinary GaAs FETs, like the MGF1302. However, if higher gain devices or HEMTS like CFY65 are used in this amplifier design, a small piece of absorber foam is usually required to avoid oscillations at very high frequencies. To avoid any additional losses at 1.5GHz, the absorber should be placed just under the cover and only above the second stage. The described preamplifier is a wideband device and does not require any particular tuning. The only adjustments necessary are the source resistors of both GaAsFETs to obtain a suitable DC bias for both stages. The gain of the described antenna amplifier is, depending on the devices used, somewhere between 25dB and 35dB. This is enough to compensate for the losses in up to 10m of RG-214 cable and the much higher noise figure of the downconverter. Since GPS or GLONASS receivers are usually used as portable equipment, the antenna and preamplifier are installed directly on the top of the receiver. The GPS receiver only requires a single-frequency (1575.42MHz) downconverter and its design is relatively straightforward. The GPS downconverter includes two modules: a RF module built in microstrip technology and an IF strip built on a simple, single-sided printed circuit board. The circuit diagram of the GPS RF module is shown on Fig. 19. The GPS RF module includes three RF amplifier stages and the first downconversion mixer. The amplifier stages are identical and use silicon MRF571 transistors. Much of the gain provided by these transistors is lost in the microstrip filters, since the latter are etched on a lossy but inexpensive glassfiber-epoxy laminate. The first downconversion to 102MHz is performed by a harmonic mixer using two anti-parallel Schottky diodes HP2900, BA481 or similar. Such a mixer has a higher noise figure than conventional diode mixers, especially when using the suggested low frequency diodes. On the other hand, the required local oscillator signal is at 736MHz, only half of the frequency required for the downconversion (1473MHz). The RF module circuit includes a network to supply with +12V the GaAs FET preamplifier through the RF cable. On the other hand, the +12V supply voltage for the RF module itself is taken out of the IF converter, after being filtered by a choke and a 100uF capacitor. The RF module is built in microstrip technology on a double-sided board made of 0.79mm thick glassfiber-epoxy. The upper side is shown on Fig. 20 while the lower side is not etched. The location of the components is shown on Fig. 21. Before installing the components, L3, L5, L7, L9 and L12 should be grounded by soldering small U-shaped pieces of wire at the marked locations. L1, L4, L6, L8 and L11 are quarter-wavelength chokes. These are made from about 6cm of 0.15mm thick copper enamelled wire, tinned for about 5mm at each end. The remaining wire is wound on a 1mm inner diameter and the finished chokes are small self-supporting coils. On the other hand, L2 is a commercial 100uH "molded" choke. It is recommended to use thin teflon coax like RG-188 for the internal RF wiring of the GPS receiver. The braid of the cable should be soldered directly to the microstrip groundplane while the central conductor reaches the upper tracks through a hole in the printed-circuit board. To avoid shorts, the copper plating around this hole on the groundplane side should be carefully removed using a much larger (3mm) drill tip. The GPS RF module needs some adjustments of the striplines and these are best performed after all of the receiver hardware is assembled. L3, L5, L7 and L9 usually need to be trimmed shorter by about 1mm at the open end to achieve the maximum gain at 1575MHz. On the other hand, L10 and L12 may need some small pieces of copper foil (about 7mmx7mm) at different locations along these striplines to achieve the best noise figure from the diodes actually used in the mixer. The GPS IF strip includes a second downconversion to 10MHz, signal amplification and limiting at 10MHz and the generation of all required local oscillator and clock signals from a single master frequency reference. The second downconversion to 10MHz and the LO frequency generation is included in the GPS IF converter module shown on Fig. 22 and Fig. 23. The GPS IF converter module includes a 6139kHz crystal oscillator (Fig. 23). This frequency is used both for signal sampling and suitably multiplied for both downconversions. Since the required short term stability is very high, in the 1.E-9 range, to be able to demodulate the 50bps PSK navigation data, the crystal oscillator has its own supply regulator 7805 and is followed by two buffer stages. The crystal oscillator output frequency is first multiplied by five to obtain 30.7MHz and then by three to obtain the 92MHz required for the second downconversion. Three additional frequency-doubler stages are required to obtain the first downconversion signal at 736MHz from the available 92MHz signal. The design of all multiplier stages is similar and is using two tuned circuits in each stage except for the first stage, where three tuned circuits are necessary due to the higher multiplication factor. The 102MHz IF signal is first amplified (BFX89) and then filtered (L9 and L10). The second mixer is a simple dual-gate MOSFET mixer (BF981). The selectivity provided by the tuned circuits at 102MHz (L9 and L10) and at 10MHz (L11) is already comparable to the GPS C/A-code signal bandwidth (2MHz). In fact, L11 already requires damping resistors to achieve the required bandwidth. The GPS IF converter is built on a single-sided board as shown on Fig. 24. The location of the components is shown on Fig. 25. Due to the limited space all of the resistors are installed vertically. The capacitors are conventional ceramic discs (except for 100uF) with a pin spacing of 5mm. Capacitive trimmers are plastic foil types of 7.5mm diameter: green 4-20pF and yellow 2-10pF. There is also a wire jumper marked with "A". The BFX89 is used as an universal RF transistor in this module and has many possible replacements: BFY90, BFW30 etc. The four leads of the BF981 MOSFET are bent so that the device is inserted in the printed-circuit board with the marking towards the board. The 7805 regulator does not require a heat sink provided that it is a TO-220 version. The GPS IF converter includes several inductors. Most of them are air-wound, self-supporting coils wound with copper enamelled wire of either 0.5mm or 1mm diameter. The turns of these coils are not spaced and the leads go straight through the printed-circuit board without any additional bending or forming. In these way the coils themselves have about 1/4 of a turn less than specified in the following paragraph. L1 and L2 have 3 turns each of 1mm wire wound on a 4mm inner diameter. L3 has 5 turns of 0.5mm wire wound on a 3mm inner diameter. L4 and L5 have two turns each of 1mm wire wound on a 3mm inner diameter. L6 has 3 turns of 0.5mm wire wound on 3mm inner diameter. L7 and L8 have one single turn (or "U" loop) of 1mm wire with a 3mm inner diameter. L9 and L10 have 5 turns each of 0.5mm wire on a 4mm inner diameter. Finally, L13 and L14 have 6 turns each of 0.5mm wire wound on a 4mm inner diameter. L13 has an additional coupling loop of one single turn around the main winding. L11, L15, L16, L17 and L18 are wound on standard cores for IF transformers (Toko or Mitsumi) with the external dimensions of 10mmX10mm. L11 should have about 4.5uH and in practice this means 15 turns of 0.15mm diameter copper enamelled wire on a 10.7MHz IF transformer core set including a fixed central ferrite core, an adjustable ferrite cup, various plastic support parts and a metal shielding can. L15, L16 and L17 should have about 0.4uH and in practice have 6 turns of 0.15mm diameter copper enamelled wire on a 36MHz IF transformer core set including a plastic support with a central adjustable ferrite screw, a plastic cap and a metal shielding can. The exact value of L18 depends on the crystal used and the frequency required. In all of the prototypes built inexpensive computer crystals designed for 6144kHz were used. These require quite a large inductance to be pulled 5kHz down to about 6139kHz. An inductance around 40uH is required for this shift. The exact value depends much on the crystal used and the parasitic capacitances of the circuit. Since the performance of the GPS receiver depends on the stability of this master crystal oscillator, also L18 needs to be very stable. Therefore a 36MHz IF transformer core set is recommended and the latter requires about 60 turns of 0.08mm diameter copper enamelled wire. Finally, L12 is a 100uH "molded" choke. The GPS IF converter has several connections. The two coax cables carrying IF and LO signals to the RF module and the +12V supply wire for the RF module are all soldered directly to the bottom side of the IF converter module. The 10MHz IF output, the 6139kHz clock output and the +12V supply voltage are available on a 7-pin connector obtained from a piece of a good-quality IC socket with round contacts. The GPS IF module requires several adjustments, but the crystal oscillator should be adjusted first to roughly 6139kHz. Then the multiplier chain should be adjusted. Each multiplier stage should be adjusted to provide the maximum signal at the required frequency to the next stage. The levels of the RF signals can be easily monitored with a DC voltmeter, since they are rectified by the BE junction of the next stage. Without any RF input, the DC voltage is set to about 0.7V across the BE junction. When the multiplier chain is operating correctly, this voltage should decrease down to about zero and may even become negative. If the transistor base goes more negative than -0.5V, RF transistors may be damaged and this should be avoided by decreasing the values of the coupling capacitors. Of course, the voltmeter required for these adjustments should only be connected through a RF choke to avoid disturbing the RF circuit. A 10kohm resistor may also be used as a RF choke. In this way all of the multiplier stages can be adjusted except the last one to 736MHz, since no BE junction follows this stage. The level of the 736MHz signal is monitored in a different way, by connecting a DC ohmmeter to the IF output of the mixer. The higher the LO signal level, the lower the resistance measured by the ohmmeter. The signal circuits (L9, L10 and L11) are best adjusted after the receiver is completely assembled, since the following IF amplifier has a S-meter output. A grid-dip meter can be used as a signal source at 102MHz. The trimmers in parallel to L9 and L10 tune almost to their maximum capacity and L10 may sometimes require an additional capacitor in parallel. The final adjustment of the signal circuits is best performed on a real GPS signal obtained from a directional antenna (a 15 turn helix or a small dish) pointed to a GPS satellite. Finally, the crystal oscillator should be adjusted to the exact frequency required by the software. For the current version V122 the exact frequency is 6139.050kHz, but this may change in the future. The exact frequency is specified in the program listing. The GLONASS receiver requires a tunable downconverter across all of the 25 GLONASS channels spacing from 1602MHz to 1615.5MHz, therefore its design is more complicated than the GPS counterpart. The GLONASS downconverter is divided into four modules for shielding purposes and differences in the construction technology: a RF module and a PLL synthesizer converter built in microstrip technology and an IF converter and synthesizer logic built on simple, single-sided printed circuit boards. The circuit diagram of the GLONASS RF module is shown on Fig. 26. The GLONASS RF module includes two selective RF amplifier stages, the first receiver mixer to the first (fixed) IF of 118.7MHz, and a VCO followed by a buffer stage. The two RF amplifier stages are identical and use MRF571 transistors. Since the GLONASS RF module is built on a lossy, but thicker laminate than GPS, the losses in the RF filters are lower and two amplifier stages provide enough gain. The VCO includes an amplifier (BFR91) and a highly-selective interdigital filter feedback network. Such a VCO can only cover a very limited frequency range (about 10% around the central frequency), but its phase noise is very low. The VCO is tuned by a BB105 varicap in the central finger of the interdigital feedback network. The VCO is followed by a buffer stage with another BFR91. A microstrip coupler takes part of the VCO output signal to drive the PLL circuits. The VCO and RF signals are then combined in an interdigital filter network to feed the mixer diode HP2900 or BA481. The GLONASS RF module circuit includes a network to supply with +12V the GaAs FET preamplifier through the RF cable. The GLONASS RF module is built in microstrip technology on a double-sided board made of 1.57mm thick glassfiber-epoxy. The upper side is shown on Fig. 27 while the lower side is not etched. The location of the components is shown on Fig. 28. Before installing the components, the resonators of L3, L5, L6 and L7 should be grounded by soldering short pieces of 1mm diameter copper wire at the marked locations. The transistors and diodes are installed in 6mm diameter holes in the printed circuit board. L1, L4, L8 and L12 are quarter-wavelength chokes. These are made from about 6cm of 0.15mm thick copper enamelled wire, tinned for about 5mm at each end. The remaining wire is wound on a 1mm inner diameter and the finished chokes are small self-supporting coils. On the other hand, L2, L9 and L11 are commercial 120uH "molded" chokes. RF interconnections inside the GLONASS receiver are made with thin teflon coax like RG-188, installed just like in the GPS receiver front end. On the other hand, GLONASS microstrip modules include feedthrough capacitors to save space on the printed-circuit boards. The feedthrough capacitors are soldered to the microstrip groundplane from the bottom side. Some components, like chokes and resistors in the supply network, are also installed on the bottom side of the microstrip boards. The GLONASS RF module only needs few adjustments, mainly to the VCO feedback network. To cover the desired frequency range, the central finger usually needs to be trimmed shorter by several mm. The two side fingers may need adjustments if the VCO stops oscillating at band edges. The remaining interdigital filters usually do not need any adjustments to provide the best performance in the desired frequency range. If the VCO is operating correctly, the mixer diode will provide a rectified voltage of about -0.4V across the 150ohm resistor. The GLONASS IF strip includes a second downconversion to 10.7MHz, signal amplification and limiting at 10.7MHz and the generation of the required local oscillator and clock signals from a single master frequency reference. The second downconversion to 10.7MHz and the LO frequency generation is included in the GLONASS IF converter module shown on Fig. 29. The GLONASS IF converter module includes a 18MHz master crystal oscillator. This frequency is used, divided by four, for signal sampling, divided by 32 as the PLL reference frequency and suitably multiplied for the second signal downconversion and for the PLL downconversion. The GLONASS IF module only includes the oscillator and some multiplier stages. The dividers are located in the PLL synthesizer logic module and the last frequency multiplier is in the PLL synthesizer converter. Like in the GPS receiver, the required short term stability is very high, in the 1.E-9 range, to be able to demodulate the 50bps PSK navigation data Therefore the crystal oscillator has its own supply regulator 7805 and is followed by two buffer stages just like in the GPS IF converter module. The crystal oscillator output frequency is first multiplied by three to obtain 54MHz. This signal is then doubled to 108MHz for the second downconversion and multiplied by three to obtain 162MHz to drive the PLL synthesizer converter, using two separate multiplier stages fed by the same 54MHz signal. The 162MHz signal is further amplified in a buffer stage (BFR96) to drive the SRD multiplier in the PLL synthesizer converter. Since the described GLONASS receiver includes a more complicated RF front-end than GPS, more filtering is required in all multiplier stages to avoid spurious frequencies. Therefore multiplier stages may have three or even more tuned circuits on their outputs. The 118.7MHz IF signal is filtered (L9, L10 and L11) and amplified (BFX89). The second mixer is a simple dual-gate MOSFET mixer (BF981). The selectivity provided by the tuned circuits at 118.7MHz (L9, L10 and L11) and at 10.7MHz (L12) is already comparable to the GLONASS C/A-code signal bandwidth (1.2MHz). In fact, L12 already requires damping resistors to achieve the required bandwidth. The GLONASS IF converter is built on a single-sided board as shown on Fig. 30. The location of the components is shown on Fig. 31. Due to the limited space all of the resistors are installed vertically. The capacitors are conventional ceramic discs (except for 100uF) with a pin spacing of 5mm. Capacitive trimmers 4-20pF are a plastic foil type of 7.5mm diameter, marked with a green body. There is also a wire jumper marked with "A". The BFX89 is used as an universal RF transistor like in the GPS IF converter. Also the BF981 is installed just like in the GPS IF converter module and a TO-220 case 7805 regulator is recommended so that no heat sink is required. The GLONASS IF converter includes several inductors. Most of them are air-wound, self-supporting coils wound with copper enamelled wire of 0.5mm diameter. The turns of these coils are not spaced and the leads go straight through the printed-circuit board without any additional bending or forming. In these way the coils themselves have about 1/4 of a turn less than specified in the following paragraph. L5, L6 and L7 have 4 turns each wound on a 3mm inner diameter. L9, L10 and L11 have 4 turns wound on a 4mm inner diameter. L13 and L14 have 5 turns wound on a 4mm inner diameter. L14 has an additional coupling loop of one single turn around the main winding. L1, L2, L3, L4 and L12 are wound on standard cores for IF transformers (Toko or Mitsumi) with the external dimensions of 10mmX10mm. L12 should have about 4.5uH and in practice this means 15 turns of 0.15mm diameter copper enamelled wire on a 10.7MHz IF transformer core set including a fixed central ferrite core, an adjustable ferrite cup, various plastic support parts and a metal shielding can. L2, L3 and L4 should have about 0.13uH and in practice have 3 turns of 0.3mm diameter copper enamelled wire on a 36MHz IF transformer core set including a plastic support with a central adjustable ferrite screw, a plastic cap and a metal shielding can. The exact value of L1 depends on the crystal used and the frequency required. In all of the prototypes built inexpensive computer crystals designed for 18000kHz, series resonance, were used. These require a small inductance in series to compensate for the feedback capacitors of the oscillator network. In practice about 2uH were required, corresponding to 16 turns of 0.15mm diameter copper enamelled wire on a 36MHz IF transformer core set. Finally, L8 is a VK200 "six-hole" ferrite choke and L15 is a 100uH "molded" choke. The GLONASS IF converter module has several connections. The two cables carrying the 118.7MHz IF from the RF module and the 162MHz LO to the PLL synthesizer converter are all soldered directly to the bottom side of the IF converter module. The 10.7MHz IF output, the 18MHz clock output and the +12V supply voltage are available on a 7-pin connector obtained from a piece of a good-quality IC socket with round contacts. In the GLONASS IF converter module the multiplier stages should be aligned first, just like in the similar GPS module. However, only the output of the first multiplier stage to 54MHz can be monitored as a dip of the following stage base voltage. The output of the 108MHz multiplier may be observed as a dip in the drain voltage of the BF981 mixer, while the output of the 162MHz multiplier may be measured as the rectified voltage by the SRD multiplier in the PLL synthesizer converter. The signal circuits (L9, L10, L11 and L12) are best adjusted after the receiver is completely assembled, since the following IF amplifier has a S-meter output. A grid-dip meter can used as a signal source at 118.7MHz. The trimmers in parallel to L9, L10 and L11 tune almost to their maximum capacity. The final adjustment of the signal circuits is best performed on a real GLONASS signal obtained from a directional antenna (a 15 turn helix or a small dish) pointed to a GLONASS satellite. Finally, the crystal oscillator should be adjusted to the exact frequency required by the software. For the current version V39 the exact frequency is 18000.000kHz, but this may change in the future. The exact frequency is specified in the program listing. A single-channel GLONASS receiver requires a fast-settling frequency synthesizer, since the receiver is continuously switching among different frequency channels. Besides this requirement the synthesizer should have a low phase noise. To limit group-delay variations the synthesizer should supply a variable frequency already to the first downconverter. All these requirements ask for a PLL synthesizer with a frequency downconverter in the feedback loop, to decrease the divider modulo and increase the loop gain. Therefore, the GLONASS PLL synthesizer includes a VCO in the RF module, a downconverter and conventional PLL synthesizer logic like variable modulo dividers and a frequency/phase comparator. The circuit diagram of the GLONASS PLL synthesizer converter is shown on Fig. 32. The circuit includes another buffer stage for the VCO signal around 1490MHz, a step-recovery diode (SRD) frequency multiplier by 9, to get 1458MHz from the available 162MHz, a mixer diode and an IF amplifier stage. The VCO buffer stage (BFR90) is required to avoid getting any unwanted spurious signals back in the GLONASS RF module. The SRD multiplier uses a very inefficient silicon PN-junction diode 1N4148. Other diodes like VHF TV tuner bandswitching diodes (BA182 or BA482) provide an up to 20dB stronger signal at 1458MHz in the same circuit, but a higher signal level is not required here and it is even harmful, since it may get in the RF module and cause unwanted mixing products. In practice it is thus convenient to keep the 1458MHz signal level low and drive the mixer diode into the nonlinear region with the 1490MHz VCO signal. To avoid any spurious generation all signal levels are kept low. Even the buffered VCO signal amounts to only a few hundred mV on the mixer diode HP2900 (or BA481) while the 1458MHz signal level is much lower. To operate efficiently at low signal levels the mixer diode receives a DC bias current. The PLL IF signal then needs much amplification to reach the TTL level required by the variable-modulo counter. The first PLL IF amplifier stage (BFR90) is built in the PLL converter module. The following PLL IF amplifier stages are located in the PLL synthesizer logic module for shielding purposes, since harmonics of the PLL IF fall in the first IF (118.7MHz) frequency range of the described GLONASS receiver. The GLONASS PLL synthesizer converter is built in microstrip technology on a double-sided board made of 1.57mm thick glassfiber-epoxy. The upper side is shown on Fig. 33 while the lower side is not etched. The location of the components is shown on Fig. 34. Before installing the components, the resonators of L1, L3 and L4 should be grounded by soldering short pieces of 1mm diameter copper wire at the marked locations. The transistors and diodes are installed in 6mm diameter holes in the printed circuit board. L2, L5, L7 and L8 are quarter-wavelength chokes. These are made from about 6cm of 0.15mm thick copper enamelled wire, tinned for about 5mm at each end. The remaining wire is wound on a 1mm inner diameter and the finished chokes are small self-supporting coils. L6 is a self-supporting coil with 3 turns of 0.5mm diameter copper enamelled wire wound on a 3mm inner diameter. The microstrip filters in the GLONASS PLL synthesizer converter usually do not require any trimming. The 10kohm trimmer for the SRD bias current is usually set to 5kohm. The SRD multiplier will operate correctly if the rectified DC voltage by the 1N4148 diode amounts to about 2V. To convert the frequency range form 1602MHz to 1615.5MHz down to 118.6875MHz, the VCO must operate in the frequency range from 1483.3125MHz to 1496.8125MHz. Subtracting 1458MHz in the PLL synthesizer converter, this frequency range is downconverted to 25.3125MHz to 38.8125MHz. The latter frequency range corresponds to integer multiples ranging between 45 and 69 of the GLONASS channel spacing of 562.5kHz. The design of the PLL synthesizer logic is therefore straightforward and the corresponding circuit diagram is shown on Fig. 35. The PLL synthesizer logic includes a PLL IF amplifier, a variable modulo divider for the PLL IF, a fixed divider by 32 to obtain the 562.5kHz reference and a frequency/phase comparator. The PLL IF signal in the range from 25MHz to 39MHz is first amplified to a TTL level in a two stage amplifier. The gain of this amplifier is set higher than required to have a considerable safety margin. The base bias resistor of the second stage may need some trimming although the suggested value of 2.2kohm will usually work. The programmable modulo counter is built from two synchronous counters: a 74F161 and a 74HC161. A 74Fxxx counter is required in the first stage to operate reliably at the highest frequency, since the PLL IF may be several tens of MHz above 39MHz in the unlocked state! The counter feedback network includes an inverter and a 74HC157 multiplexer. The modulo of the second counter (74HC161) is programmed directly. The modulo of the first counter (74F161) is set to 10 except during the last state of the second counter, when the 74HC157 switches the 74F161 preset inputs to the 4094 outputs. In this way setting the modulo of the second counter changes the whole divider modulo in steps of 10, while setting the modulo of the first counter during the last cycle only provides the single-count steps. The 4094 is a 8-bit shift register with output latches. It is used as a serial-to-parallel interface driven by the computer. Of the eight available output lines, four are used to control the modulo of the 74HC161 counter and the other four to control the modulo of the 74F161 during the last cycle of the 74HC161. One should be especially careful when programming the modulo of the divider: the data is inverted and the first divider modulo should never be set too low to allow for the delays in the slower 74HCxxx logic! The 18MHz master reference frequency is also amplified to TTL level in a single-stage amplifier (2N2369). A 74HC393 counter divides this frequency by four to obtain the 4500kHz sampling frequency and by 32 to obtain the PLL reference frequency. The 4500kHz signal is attenuated with a resistor network to limit spurious radiations. It is then amplified back to TTL level in the dedicated DSP hardware module. The frequency/phase comparator is a charge-pump circuit including two D-flip-flops (74HC74), a feedback network with a NAND gate and charge-pump switches with Schottky diodes. The backlash problem is solved by making the charge-pump circuit faster than the feedback network. This does not make the phase detector linear yet, but provides a stable locking point for the PLL with no dead zone and produces a very clean synthesizer signal spectrum. An additional NAND gate provides a LOCK signal for test purposes. The GLONASS PLL synthesizer logic is built on a single-sided printed circuit board as shown on Fig. 36. The location of the components is shown on Fig. 37. There are three wire jumpers on this board and two of them are installed below the 74HC157 multiplexer. A complex single-sided board also places some constraints on the installation of the resistors: those with a 10mm hole spacing are installed horizontally while the others are installed vertically to save space. All of the capacitors are ceramic with a 5mm pin spacing, including the 1uF (multilayer). L1 is a commercial 100uH "molded" choke. The module has three connectors with 3, 4 and 7 contacts, made from pieces of good-quality IC sockets. The integrated circuits should be soldered directly on the board except for the 4094. It is recommended to install this IC on a socket so that it can be removed from the circuit and replaced by wire jumpers to be able to test the synthesizer without the computer running. The GLONASS synthesizer logic may require a single adjustment: the bias resistor for the second PLL IF amplifier stage. This may be adjusted if the output DC voltage deviates much from 1.3V (with no input signal) or if the programmable counter does not operate reliably. Both GPS and GLONASS receivers require a limiting IF amplifier at the final IF frequency around 10MHz. The circuit diagram of this amplifier is shown on Fig. 38. The GPS/GLONASS second IF amplifier includes a first stage with a bipolar transistor BFX89 and a second stage with the integrated circuit CA3089. The gain of the first stage is limited by the 22ohm resistor in the emitter circuit. The first stage is followed by a tuned circuit (L1) to limit broadband noise and avoid amplifying various spurious signals from the many oscillators inside a GPS or GLONASS receiver. The damping resistor in parallel with L1 sets the bandwidth of this tuned circuit to be comparable to the GPS or GLONASS signal bandwidth. The second stage uses a popular FM IF strip integrated circuit. The latter provides wideband amplification and limiting, while the discriminator section of this integrated circuit is not used here. The limited IF output is available on pin 8 and the signal level amounts to a few hundred millivolts at 10MHz. This is not enough to drive the following TTL logic directly and the remaining gain is built inside the dedicated DSP hardware module. The CA3089 integrated circuit includes a S-meter output. The latter is of little use during actual receiver operation, since the satellite signal levels are comparable to noise in the wideband IF. In the case of a GPS receiver, the S-meter output can only show the sum of all of the signals present. On the other hand, the S-meter output is very useful during receiver testing and alignment of the RF, first and second IF tuned circuits. Both GPS and GLONASS receivers include a S-meter function inside the narrowband IF processing. Since the latter is done in software, the real receiver S-meter as displayed on the LCD is just another software function and is NOT related to the hardware S-meter output of the IF strip. The GPS/GLONASS second IF amplifier is built on a single-sided printed circuit board as shown on Fig. 39. The location of the components is shown on Fig. 40. Due to the limited space all of the resistors are installed vertically. The capacitors are conventional ceramic discs (except for 22uF) with a pin spacing of 5mm. L1 is wound on a 10.7MHz IF transformer core set including a fixed central ferrite core, an adjustable ferrite cup, various plastic support parts and a metal shielding can. The primary (resonant) winding of L1 has 10 turns of 0.15mm diameter copper enamelled wire, corresponding to an inductance of about 2uH. The secondary (link) winding has two turns of the same wire. L2 is a 100uH "molded" choke. The second IF amplifier module has two connectors: a 2-pin connector for the input and a 5-pin connector for the output and supply voltage, obtained from pieces of a good-quality IC socket with round contacts. The tuned circuit with L1 is best adjusted after the GPS or GLONASS receiver is completely assembled, finding the maximum DC voltage on the "test" S-meter output in the same IF module. The final adjustment of all signal circuits is best performed on a real satellite signal obtained from a directional antenna (a 15 turn helix or a small dish) pointed to an operating navigation satellite. A directional antenna should provide a higher-than-usual signal-to-noise ratio of more than 10dB already in the wideband IF. A high SNR is required to tune the circuits to the signal peak and not to noise or some spurious signals while observing the voltage on the "test" S-meter output.